The significant singular role that human beings play in the conservation of our environment resulted in an exhibition inspired by the personal interaction with and perception of the natural world by participating artists. 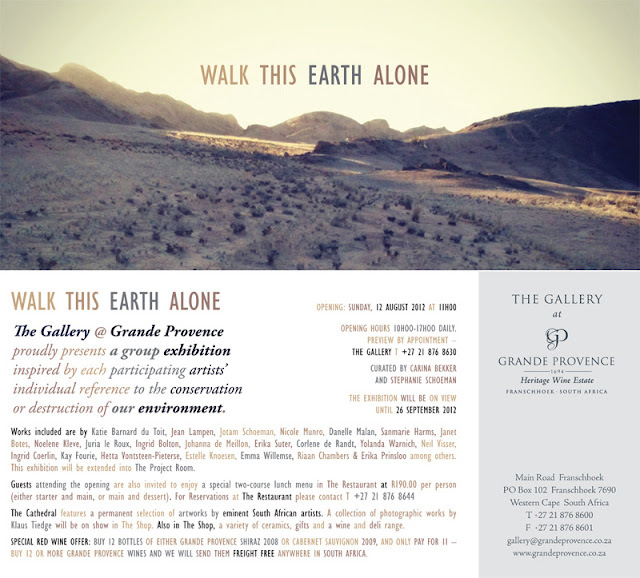 This exhibition creates an awareness of a wide range of environmental matters that will ultimately inspire the conservation or destruction of the environment that we choose to live in, from the perspective that we walk this earth alone. Contributing artists include Katie Barnard du Toit, Jean Lampen, Jotam Schoeman, Nicole Munro, Danelle Malan, Sanmarie Harms, Janet Botes, Noelene Kleve, Juria le Roux, Ingrid Bolton, Johanna de Meillon, Erika Suter, Corlene du Randt, Yolanda Warnich, Neil Visser, Ingrid Coerlin, Kay Fourie, Hetta Vontsteen-Pieterse, Estelle Knoesen, Emma Willemse, Riaan Chambers, Erika Prinsloo among others. “Environmental awareness, whether it be as an individual or in a group, starts with that person or group experiencing some kind of a connection to the natural world. A point of entry: Care, Concern, Gratitude, Wonder… Awe… For artists, it is this connection to our environment that spurs expression – action! It is this connection that fuels and inspires us and gives us the ability to fuel and inspire others.